This recent blog by Moore Stephens details an increase in the percentage of cases where a Director was reported for investigation following a business insolvency, with the figure now at around 30%. 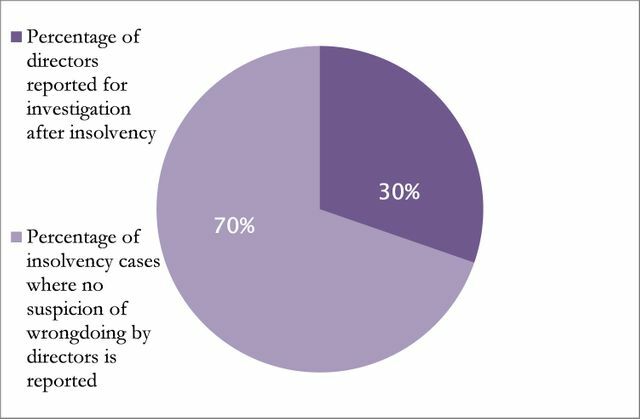 It also outlines an increase in the percentage of cases where the Insolvency Service have started disqualification proceedings after a Director has been reported to it, with the figures at 21% and 19% for 2011/12 and 2012/13 respectively, jumping to 27% for 2013/14. What does this mean for Company Directors and for Creditors in a business Insolvency? Firstly for Directors, it is clear that the authorities are taking alleged misconduct very seriously. It is therefore vital that Directors are continually aware of their legal responsibilities and take the appropriate professional advice as soon as an insolvency event becomes even a remote possibility. To that end, Pitmans LLP provides a Directors' Toolkit on their website which provides a clear and concise guide to some of rights, responsibilities and duties of a Director. This can be found here http://www.pitmans.com/directors-toolkit/. Secondly for Creditors, whilst this approach from the Insolvency Service may have little effect on the dividend initially received in the insolvency , Insolvency Practitioners are entitled to pursue Directors of an insolvent company for compensation for Creditors in respect of any breaches of Director's duties and if successful this will result in a better return for Creditors. It could be the case be that in these circumstances, a Creditor may be more amenable to funding some of the Insolvency Practitioner's litigation costs. If you are a Director or a Creditor concerned about breaches of Director's duties, then please do not hesitate get in touch with either Denise Fawcett (dfawcett@pitmans.com) or Marc Livingston (mlivingston@pitmans.com) at the Pitmans LLP London office and we would be happy to discuss your options with you.